The Rode Rodecaster Pro is a pretty unique piece of audio gear, because it’s designed entirely with podcasting in mind. That’s exciting for the medium as a whole, because it shows that podcasting is a market worth investing in. It’s also exciting because Rode will already do very well in the musician and voice over worlds. They won’t have just decided to make a product like this on a whim. When one turned up on our doorstep recently recently (completely by surprise, thanks Rode!) it was immediately obvious that a lot of thought and research had gone into this design. With that said, there’s still undoubtedly room for improvement on a couple of fronts. We’ll take a look at those in this review, along with the many great features this unit has to offer. What is the Rode Rodecaster Pro? The Rodecaster is described by Rode as “the world’s first fully integrated podcast production studio”. What does that actually mean though? Well, if you took a mixer, cleaned it up, and made it much less complicated looking, then merged it with a digital recorder, that should give you a basic idea of what the Rodecaster is and does. Mixers are handy things for plugging in multiple mics, doing live shows, and recording Skype calls. But mixers can’t work in isolation, and they can’t save or store audio. The Rode Rodecaster can, so right away it’s going to simplify a lot of lives by swapping multiple pieces of kit and cables for one single unit. You don’t even necessarily need a computer to record with the Rodecaster. What can the Rode Rodecaster Pro do? The Rodecaster has a few different talents. For one, it gives you the capability to record phone calls. Whether or not this is a selling point will depend entirely on your niche. If your audience and guests are not overly technical, and unlikely to own mics of their own, then chatting to them over the phone might be the most practical option. Although you don’t need a computer to run the Rodecaster, you can easily connect to one in order to record Skype or online interviews too. You can also use the computer connection to record into your favourite DAW, as opposed to the device’s own memory card. How many mics can I plug in? You can plug in up to four XLR mics at once, so you can have four people in the room together recording a podcast. Each mic can be uniquely set up via the control panel, where there’s a few different options and presets. We’ll take a look at these in more detail further on. The Rodecaster was originally released without a multitrack option, so everything would need to be recorded into one single stereo track. This was surprising to many in podcasting who expected such a feature to be included right from the get go. 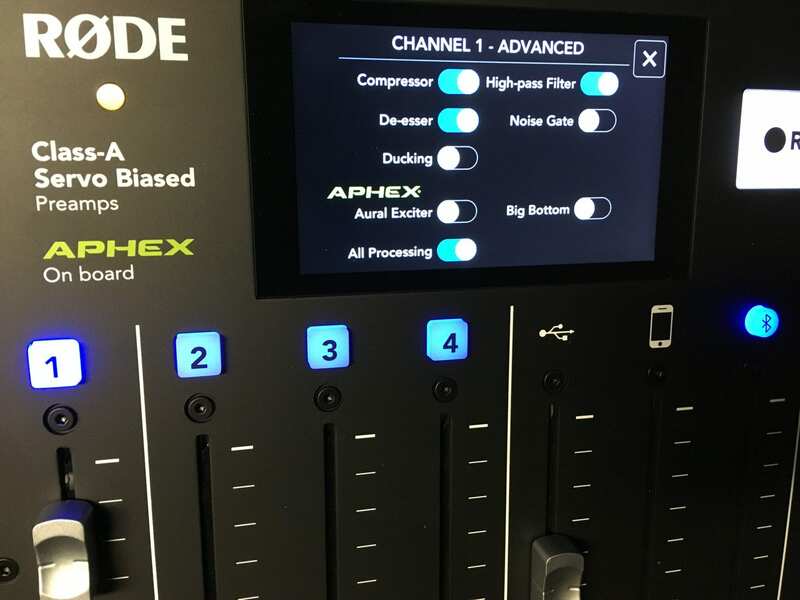 To their credit, Rode acted on this feedback and released a firmware update in February 2019, introducing a new multitrack recording capability. Unfortunately however, multitrack recording is currently only available via USB, when using a computer and a DAW. It isn’t available when recording directly onto the device’s SD card. It isn’t exactly simple to set up either. I had to download ASIO4ALL to get it working with Adobe Audition on a PC. It’s great to see that Rode are receptive to feedback and work hard to make improvements to the Rodecaster. At the time of writing though it’s hard to recommend the device for someone specifically looking for a multitrack recorder, unless they’ve a decent level of audio experience under their belt already. Hopefully in the next update, we’ll see a much more straightforward ‘multitrack to SD card’ option brought in. Until then though, this can’t really be seen as a huge selling point. You can independently control the settings of each mic that’s plugged in. Each input has its own gain slider, ‘mute’ button, and ‘solo’ button. There’s a few processing options you can toggle on and off too. Personally, these are things I prefer to do in post-production. But they’re a nice feature if you don’t know much about audio production, or prefer to spend as little time as possible doing it. Here’s a sound sample of me recording with the Rode Procaster into the Rodecaster, and calling Colin on the phone and Skype. Try saying that sentence out loud . . .
Another big plus for the Rodecaster is the options for monitoring your recordings. There’s four headphone jacks on the back of the unit, and you can control their volumes independently. This means that even if one person was particularly hard of hearing, they could have their headphone volume turned up high without it affecting anyone else. With other devices, you’d need an additional piece of equipment like a headphone amp or splitter for this, which in-turn, takes up more room and adds more cables and wires to your setup. The headphone jacks are 1/4″ TRS, so if you prefer to use a set of earbuds you’ll just need to pick up a little adapter, which you can get for about $2 on Amazon. There’s 1/4″ Left and Right outputs to connect to studio monitors or speakers too, and these also have their own independent volume control. Aside from the inputs and outputs mentioned already, there’s two more worth mentioning. The USB connection is what you would use for recording Skype calls or anything else from a computer. It has its own level-control fader, solo button, and mute button. There’s a 3.5mm TRRS jack which enables you to hook your phone up to the Rodecaster and record calls that way. Again, it has a level-control fader, solo button, and mute button. You can also connect your phone via Bluetooth, and it has the same 3 channel controls as the above. You’ll still need at least one microphone to podcast with the Rodecaster. When you connect a Rode mic (such as the Procaster) the unit automatically recognises it on the control panel. Presumably the preamps will be designed to optimise the sound of any Rode mic you connect. Aside from that, depending on which mic you use you might want to get a boom arm. Headphones are always a good idea too. There’s no memory card included, so you’ll need one of those. It uses a micro SD card. You will also need access to mains power to use the Rodecaster. 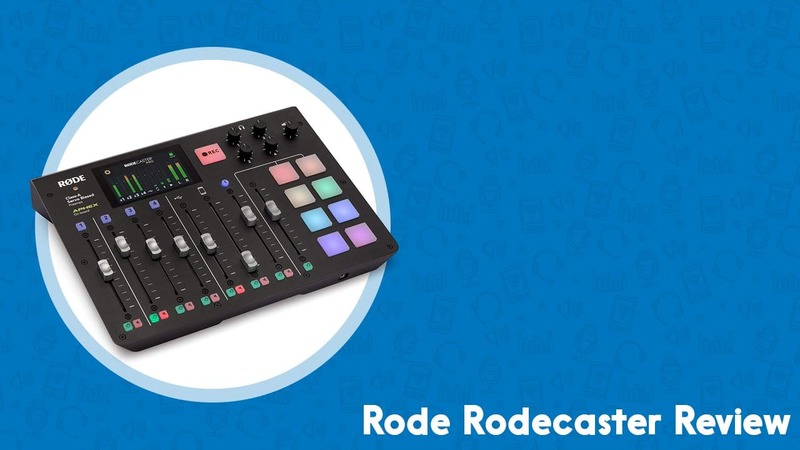 Who would use the Rode Rodecaster Pro? While Rode’s target market here is most definitely “podcasters,” that’s still a big group of people with many different needs and wants, and budgets. You Might Want One If . . .
You want the capability to easily record phone and Skype interviews. Your guests are unlikely to have decent mics of their own, meaning you’ll do a lot of interviews over the phone. You want the least amount of equipment, cables, and connections possible in your setup. You want to record live shows, or record your episodes “as-live” with effects and music played in real time. You want to record up to four people locally, and also bring in a Skype or phone guest. You want your equipment to be as simple as possible. You want a portable setup that you can easily take on the road with you. You Might Not Want One If . . .
You already have a well-tuned workflow and setup in your studio. You’re on a tight budget. The Rodecaster will set you back $600 – and you’ll still need to buy mics on top of that. If you have very little money to spend, check out What’s the minimum equipment I need to podcast? You record solo/monologue episodes, in which case, the Rodecaster is overkill for your needs. The multitrack option being USB-only will be a sticking point for some. As I’ve said, it’s good to see a company being receptive to feedback and striving to update and improve their features. But until there’s a ‘multitrack to SD card’ option available, it’s likely to put a few potential buyers off. Elsewhere, the jingle buttons are a great feature, but one downside is that you can’t see how much time left a clip has to play. There was one other issue worth pointing out too. It seems that the only way to get your recordings from the Rodecaster onto your computer is to take out the micro SD card and transfer it over manually. The USB connection won’t show up as a drag and drop Drive, which is pretty frustrating. Maybe Rode will look at fixing this too, though, as I’m certainly not the only one to have mentioned it. The Rode Rodecaster Pro is a truly unique device, and a provides a great “all-in-one” solution for many podcasters. It isn’t cheap though, and the price of $600 (not including mics) means it’s a non-starter for most. That’s not a criticism of the price, but there are a lot of podcasters who simply don’t have that sort of budget. If you’re just starting out, then you don’t need to spend nearly as much as that to get up and running. Again, take a look at the minimum equipment needed to podcast for more on that. If you’ve been podcasting for a while now and know you’re not going to suddenly quit tomorrow though, then maybe the Rodecaster’s many features will be appealing enough to you that you can justify the price. If you’re able to muster the funds, it’ll definitely simplify your setup, your workflow, and give you loads of flexibility around how you record your show. These things can save you a lot of time in the long run, and time is the one thing that you can’t put a price on! I also had issues getting the Rodecaster Pro to record multitrack in Audition, but I really dislike ASIO4all. At least, the computers I have at the moment don’t like it, so I was struggling. As an alternative, for recording only I now use Audacity. Select Windows WASAPI and you can choose your 14 channels, export multiple to wav then open them up in Audition for editing – it works a treat, all without needing ASIO and still getting the power of multitrack editing in Audition. When recording to the SD card, what type of file does it produce? WAV? MP3? Other? Hi Padre, it’s WAV files. Can it connect directly to my camera?